After slurping his way through bowl after bowl of Vietnamese noodle soup, an intrepid reporter crowns one the king. If chicken soup feeds the soul, then pho (pronounced “FUH”), the traditional Vietnamese beef noodle soup, is the curative for frozen bones. Usually served with a condiment tray featuring limes, chile paste, hoisin, bean sprouts, Asian basil and culantro (a sawtooth-shaped cilantro-like herb), it’s also the ultimate tableside soup buffet. Customize to your heart’s content, but for the purpose of this article, we stayed away from the extra flavorings and focused solely on the quality of the base broth, cuts of meat and noodles. 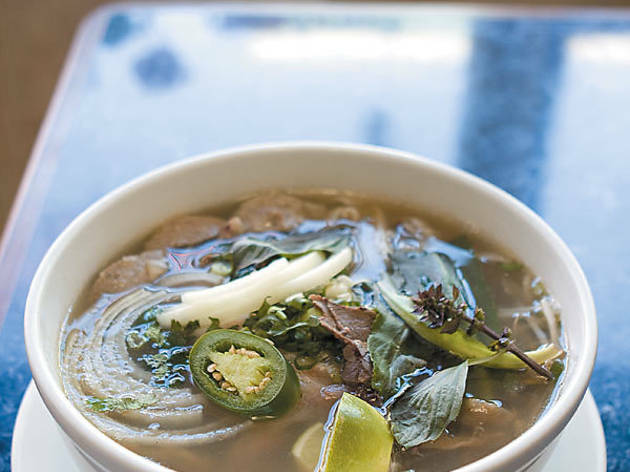 In order to ensure the most “beefiness” and to compare apples to apples, we ordered our pho at each restaurant with eye of round steak, brisket, tripe, tendon, flank steak and tendon meatballs. Excepting the pho at the Noodle (where it’s called Pho Chín, Nam, Gau, Gân, Sách) and at Tank (Pho Xe Tang), this was always the pho dac biet or “supercombo” version. Pho-gettable in every way. This broth featured an oil slick worthy of the Exxon Valdez disaster, the tripe was extra rubbery, and the rare eye of round steak was gamey and chewy. The cooks here might have to lay off the sauce, especially of the fish kind. 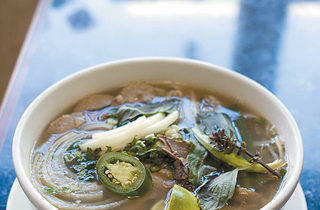 The anchovy funk and greasy, sugary-sweet broth is a combo that only a kitten might love. The rich, meaty flank steak in this bowl was only slightly redemptive. Where’s the beef? For those who don’t dig cow, this lighter golden broth was more like a chicken stock than beef broth. Of course, as a beef hater, you’d still have to contend with the chewiest, gristle-filled meatballs from our tasting. Featuring more body and thickness than any of the other bowls we tried, this was the Salma Hayek of broths. Unfortunately, a spattering of oily fat droplets and poorly diced, superfatty tubes of tripe sunk this ship. Maybe the best noodle in the bunch, which is to say fresh, slightly silky, and not the gummy or pre-made commercial variety served at most of the other pho joints. Unfortunately, the insipid broth surrounding the noodle was unbearably salty. This is the ultimate “character actor” pho. It’s a competent stew of even seasoning, beefiness and nonoffensive cuts that engages while you slurp, but it has few outlying qualities, thus making it forgettable once you finish. Even without adding the accompanying herbs, this broth had a green undertone and an inherent Asian basil perfume, along with a waft of clove and cinnamon. It might be the most popular spot among the competitors and could’ve been a contender for No. 1, but the slightly greasy finish detracted. The quality of the meat in this broth is unparalleled. The tendon is tender and lean; the tripe sliced into perfect, almost noodle-like strips; and the meatballs here (the only ones that left out gristly and fatty bits in favor of pure meat) were the best of the bunch. Unfortunately, the broth was a one-note wonder of pure, unseasoned beef. Almost every Vietnamese spot on Argyle is a shoebox-size storefront, but Pho 888 is the dinkiest. Yet, like Napoleon, it compensates for its shortcomings with bombast—in this case, a menu that proclaims “The best Vietnamese beef noodle soup.” Now, if we had a nickel for every spot that falsely claimed the best version of a dish, we could probably plug the city’s budget shortfall and save you those pesky meter increases. This spot is the exception. The broth was clean, golden, light and aromatic—like a peppery beef tea filled with pliant noodles, lean tendon, delicate tripe and rare, rich, peppery steak and flank.